Parathyroidectomy is surgery to remove the parathyroid glands or parathyroid tumors. 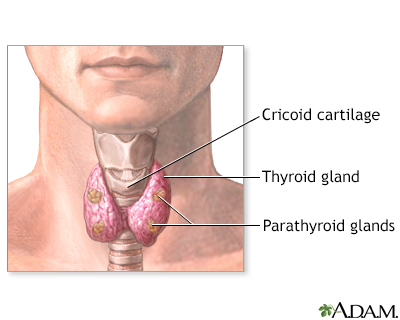 The parathyroid glands are right behind your thyroid gland in your neck. These glands help your body control the calcium level in the blood. You will receive general anesthesia (asleep and pain-free) for this surgery. 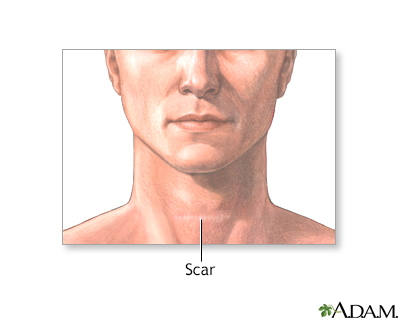 The cut is usually made in the center of your neck just under your Adam's apple. 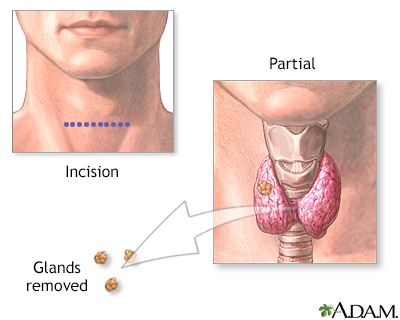 Your surgeon will look for the four parathyroid glands and remove any that are diseased. You may have a special blood test during surgery that will tell if all the diseased glands were removed. In rare cases, when all four of these glands need to be removed, part of one is transplanted into the forearm. Or, it is transplanted into a muscle in the front of your neck next to the thyroid gland. This helps ensure your body's calcium level stays at a healthy level. Minimally invasive parathyroidectomy. You may receive a shot of a very small amount of radioactive tracer before this surgery. This helps highlight the diseased glands. If you have this shot, your surgeon will use a special probe, like a Geiger counter, to locate the parathyroid gland. Your surgeon will make a small cut (1 to 2 inches; or 2.5 to 5 cm) on one side of your neck, and then remove the diseased gland through it. This procedure takes about 1 hour. Video-assisted parathyroidectomy. Your surgeon will make two small cuts in your neck. One is for instruments, and the other is for a camera. Your surgeon will use the camera to view the area and will remove the diseased glands with the instruments. Endoscopic parathyroidectomy. Your surgeon will make two or three small cuts in the front of your neck and one cut above the top of your collarbone. This reduces visible scarring, pain, and recovery time. This cut is less than 2 inches (5 cm) long. The procedure to remove any diseased parathyroid glands is similar to video-assisted parathyroidectomy. Your health care provider may recommend this surgery if one or more of your parathyroid glands is producing too much parathyroid hormone. 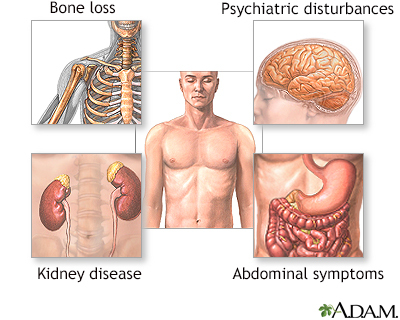 This condition is called hyperparathyroidism. It is often caused by a small non-cancerous (benign) tumor called an adenoma. Injury to the thyroid gland or the need to remove part of the thyroid gland. Hypoparathyroidism. This can lead to low calcium levels that are dangerous to your health. Injury to the nerves going to the muscles that move your vocal cords. You may have a hoarse or weaker voice which could be temporary or permanent. Difficulty breathing. This is very rare and almost always goes away several weeks or months after surgery. Before surgery, an anesthesiologist will review your medical history with you and decide what type of anesthesia to use. The anesthesiologist is the doctor who will give you the medicine that allows you to sleep and be pain free during surgery and who monitors you during surgery. Fill any prescriptions for pain medicine and calcium you'll need after surgery. You may be asked to stop taking blood thinners. These include NSAIDs (aspirin, ibuprofen), vitamin E, warfarin (Coumadin), dabigatran (Pradaxa), rivaroxaban (Xarelto), apixaban (Eliquis), and clopidegrel (Plavix). Call your surgeon if you have any numbness or tingling around your mouth in the 24 to 48 hours after surgery. This is caused by low calcium. Follow instructions about how to take your calcium supplements. People usually recover soon after this surgery. Recovery may be fastest when less invasive techniques are used. In a parathyroidectomy procedure a small horizontal incision is created just under the Adam's apple to get access to the parathyroid glands. Parathyroidectomy is recommended when the parathyroid glands produce excessive amounts of parathyroid hormone (hyperparathyroidism). After surgery, complete healing without complications usually occurs within 4 weeks. The long term outlook is excellent.